The National Weather Service In League City Has Issued A * Tornado Warning For... Madison County In Southeastern Texas... * Until 630 Pm Cdt. * At 551 Pm Cdt, A Severe Thunderstorm Capable Of Producing A Tornado Was Located 10 Miles Northeast Of Kurten, Or 14 Miles West Of ...Read More. The National Weather Service In Corpus Christi Has Issued A * Severe Thunderstorm Warning For... Northeastern Duval County In South Central Texas... Northwestern Jim Wells County In South Central Texas... Southern Live Oak County In South Central Texas... * Until 645 Pm Cdt. ...Read More. ...a Severe Thunderstorm Warning Remains In Effect Until 630 Pm Cdt For West Central Goliad...east Central Live Oak And Bee Counties... At 552 Pm Cdt, Severe Thunderstorms Were Located Along A Line Extending From Near Tulsita To Near Dinero, Moving East At 30 Mph. Hazard...60 Mph Wind Gusts And Quarter Size Hail. Source...radar Indicated. ...Read More. ...a Severe Thunderstorm Warning Remains In Effect Until 630 Pm Cdt For Dewitt...northeastern Karnes...south Central Gonzales And Southwestern Lavaca Counties... At 553 Pm Cdt, A Severe Thunderstorm Was Located Near Yorktown, Moving East At 30 Mph. Hazard...60 Mph Wind Gusts And Quarter Size Hail. ...Read More. The National Weather Service In League City Has Issued A * Severe Thunderstorm Warning For... Northern Grimes County In Southeastern Texas... Northeastern Brazos County In Southeastern Texas... Madison County In Southeastern Texas... West Central Walker County In Southeastern Texas... ...Read More. ...the National Weather Service In Houston/galveston Has Issued A Flood Warning For The Following Rivers... Davidson Creek Near Lyons Affecting The Following Counties In Texas... Burleson...washington For Davidson Creek At Lyons, Minor Flooding Is Forecasted. The National Weather Service In Houston/galveston Has Issued A ...Read More. 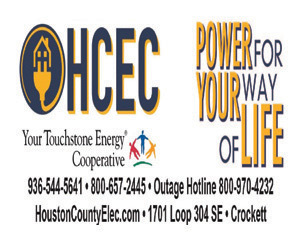 HOUSTON COUNTY – As of Sunday evening, April 14, Houston County Electric Cooperative (HCEC) has approximately 2,500 meters without power from the storm system on Saturday. Restoration efforts will continue through tomorrow. Most of the damage is located in Berea, Kennard, Tadmor, Wexhes and Ratcliff. Members in those areas will likely be without power until Monday. If you or anyone you may know has a medical condition that relies on electricity, we urge you to relocate where you can receive an alternate power source. We are utilizing all of our resources to restore power to our consumers as quickly and safely as we possibly can. Please continue to watch our website and Facebook pages for updates throughout the day and night.